KFTC has a long and rich legacy of pushing our monopoly utilities–particularly our member-owned rural electric cooperatives–towards better, more democratic governance and clean energy programs that benefit all Kentuckians. It was out of this legacy, and through the guidance of the Empower Kentucky plan, that KFTC members designed the Power House Project in early 2018. The premise of the Power House Project is simple: through accessible information, tools, and strategies, low- and moderate-income Kentuckians can lower their energy bills, learn to benefit from utility programs and solar energy, feel empowered to organize for better results from our elected officials and utilities, and strengthen their local community. Lowering our bills and holding our utilities, elected officials, and the Kentucky Public Service Commission accountable is particularly important because Kentucky’s energy system is a “regulated monopoly.” This means that each utility provider is guaranteed a monopoly over their service territory. Where you live determines where you get your energy–and how much you pay for it. Some Kentuckians are paying as much as 23% of their annual income for their electricity bills, which leads to difficult choices like living in discomfort during the winter and summer, or having to choose between keeping the lights on or putting food on the table. In the fall of 2017, KFTC members worked with our partners at Mountain Associated for Community Economic Development (MACED) to develop a curriculum that includes do-it-yourself strategies for reducing the energy used and wasted in homes, apartments and trailers, and ways to work together to get better support and accountability from our utilities and elected officials. 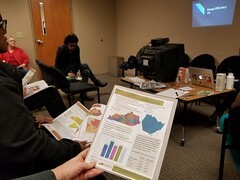 We also developed maps and materials for the workshops that show utility service territories for each county, the average energy burden on Kentucky households, state legislative districts, and other relevant data. These materials help empower workshop attendees by putting the information they need to know directly in their hands. And, we put together an innovate energy efficiency kit, valued at $25, so that every participant is able to try out their new skills as soon as they go home. As of April 2019, KFTC members have hosted 15 Power House energy efficiency workshops across the state. These free, two-hour workshops have predominantly taken place in Eastern Kentucky, in places that are serviced by Kentucky’s rural electric cooperatives. These co-ops serve 35% of Kentucky residents and are beholden to the decisions of their member-owners (unlike investor-owned utilities like Kentucky Utilities or Kentucky Power). However, we’ve also done some workshops in other parts of the state where we have a local KFTC chapter or another kind of utility. Each workshop is tailored to the county it takes place in and the utilities that operate in it. 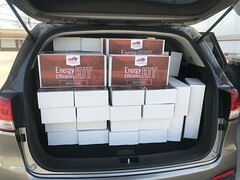 Each participant receives a folder full of resources–including local maps of the county’s energy landscape–and a free energy efficiency “kit,” valued at $25, to help them get started on sealing up their home right away. Some include an extended segment on what’s possible with renewable energy in Kentucky, and all encourage attendees to take advantage of, or ask for, energy efficiency programs offered by utilities–such as the on-bill financing program How$mart Kentucky from East Kentucky Power Cooperative. These workshops also contribute to KFTC’s broader organizing goals of building grassroots and electoral power. 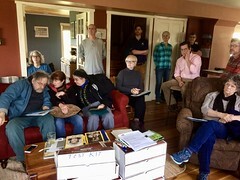 As part of every workshop’s outreach strategy, members go door-knocking in neighborhoods where bills take the biggest chunk out of people’s paycheck to invite people to the workshop–and to register them to vote or share information about upcoming state and local elections. After every workshop, we make sure to reach out to individual participants to support them in taking action, getting involved, and improving their home’s energy efficiency. Many of the folks we’ve met through these workshops have in turn joined our local chapters, joined us in local voter registration efforts, grassroots lobbied with us to protect rooftsop solar during the General Assembly, and grown as member leaders. To bring a Power House workshop to your own community, contact Nikita Perumal at nikita@kftc.org or (502) 554-6633. Blog post: Power House workshops are here!